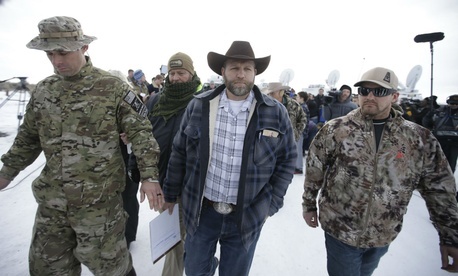 Earnest told reporters the standoff at the Fish and Wildlife Service's Malheur National Wildlife Refuge, near Burns, Ore., is a “local law enforcement matter,” but added the FBI was providing assistance. Otherwise, he said, the federal government is only involved to ensure the safety of its workforce. The head of the Federal Law Enforcement Officers Association indicated in a statement that the feds should be more involved. “The illegal takeover of any federal property is a criminal act and all those involved should be arrested and federally prosecuted," FLEOA National President Nathan Catura said. The wildlife refuge remained closed Monday, according to FWS, and will continue to be “until further notice.” President Theodore Roosevelt established the refuge in 1908 as the Lake Malheur Reservation; it now encompasses 187,757 acres of wildlife habitat, according to the FWS.